The head of the police investigation into the Hillsborough disaster has resigned due to health issues, the Home Office has said. Jon Stoddart was appointed in 2012 to lead Operation Resolve, which is examining the deaths of 96 people at an FA Cup game in Sheffield in 1989. It is due to end later this year after an inquest jury concluded in April that the fans were unlawfully killed. Home Secretary Amber Rudd said the investigation "remains on schedule". "I would like to thank Jon Stoddart for the strong, dedicated leadership he has brought to Operation Resolve since December 2012. I am sure this was a very difficult decision for him to make," she said. "Everyone involved with Operation Resolve is absolutely clear that their work will continue apace, it remains on schedule and I look forward to announcing Jon's successor in due course." Gerry Donnellan, deputy officer in overall command of the investigation, said: "Jon leaving will have no adverse impact on the inquiry. "We will continue to work hard to establish whether any individual or organisation is criminally culpable for their role in the run-up to, and on the day of, the disaster". The 96 fans died following a crush on 15 April 1989 during an FA Cup semi-final between Liverpool and Nottingham Forest at Sheffield Wednesday's Hillsborough stadium. After hearing evidence for two years in the longest inquests in British legal history, the jury found the fans were unlawfully killed. 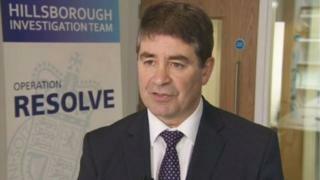 Operation Resolve is one of two criminal investigations ordered following the publication of the Hillsborough Independent Panel's report in 2012. A separate criminal investigation by the Independent Police Complaints Commission is examining police conduct.